(SEOUL=Yonhap News) The Korea Industrial Complex Corporation (KICOX) announced on September 6 that it has dispatched an export development group to Hanoi, Vietnam on September 4 to support the SMEs operating in the Industrial Complexes enter the New Southern Area. 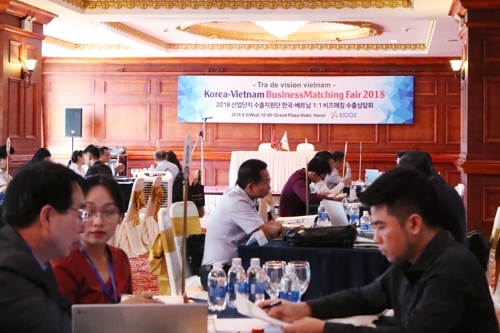 About 10 SMEs in the field of auto parts, cosmetics and electronics industries from cities including Gunsan and Changwon, which were designated as employment crisis areas, are visiting Vietnam for four days. The group held one-on-one business meetings with 100 Vietnamese buyers on the fifth. The total amount of the meetings was about USD 15 million, and Lakwoo Co., LTD. and Purecell Korea signed contracts of USD 2.2 million.